It's official - we are moved in. I unpacked my last box on Saturday and then shortly after I spent several hours hanging out in the craft room making things. To my long time followers, you know it's been a long time since I've done that. It was wonderful. The great thing about what I was making the other night is that even though I made three different things, they all follow pretty much the same steps. The sizes and quantities may be different but the over-all idea is the same. So, if you are in need of an easy craft to do with the kids - or just want to make something yourself - here you go. We'll start with the little guys. They are ornaments. Step 2 - Take your yarn and wrap it around your fingers several times. The more you wrap the fuller the beard. I wrapped it about 5 or 6 times. 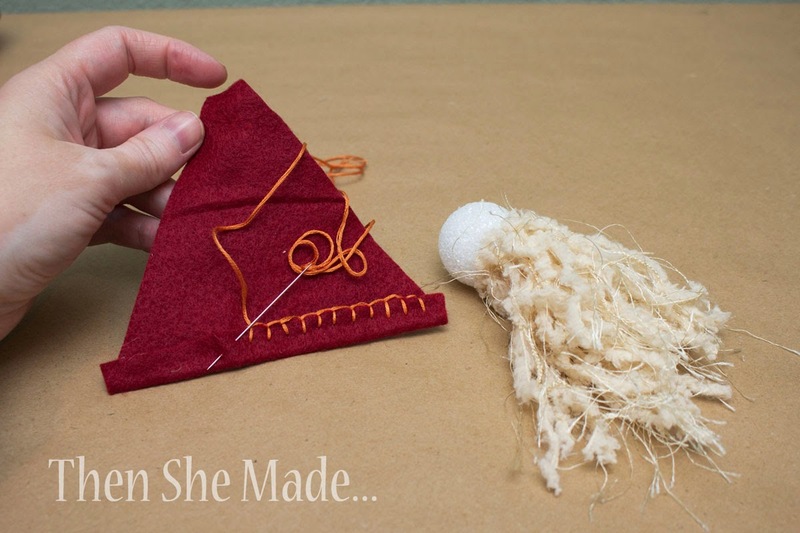 Carefully remove the yarn from your fingers, keeping it in a circle and lay it down. Step 3 - Then, take a piece of yarn, a single strand, and put it through the circle and then tie it in a knot. This will secure all the yarn together. Step 4 - Once it is tied together, clip the opposite end so you no longer have loops. Step 5 - Repeat the steps above so you have two sections of yarn, tied together and clipped like shown in photo above on the right. Step 6 - Next, take one section of yarn and hot glue it to the bottom of your ball. Step 7 - Now, take the other section of yarn and glue it slightly above the other section. This will cover the bottom of the ball and give you a nice full beard. Step 8 - Now we can move on to the felt. Take a piece of felt and wrap it around the ball. You want it to slightly over lap the starting point. Then, use scissors to cut a small notch to mark it. Unwrap from ball and continue cutting the felt so you have a piece that is the right size to make the hat. Step 9 - To make the hat you want to fold the felt in half and then on the side opposite the fold, cut on a diagonal. You should have a triangle when you are done. Optional: You can now add in some embroidery work if you want. I'm not great at hand sewing but I did want to add a little somethin' to the brim. I choose a quick blanket stitch for mine. You could completely skip this step or even just glue something in place. Step 11 - Once your hat is ready, place it right along the beard line and glue in place in the back. Glue first along the brim, and then fold the hat and glue along the long edge that closes the hat. To finish the hat off, just run a quick piece of floss through the point and tie the floss into a loop. This will act as the hanger for the ornament. Step 12 - Your last step is to just add the nose and then you are done! So, there you have it. That's how you make an ornament. 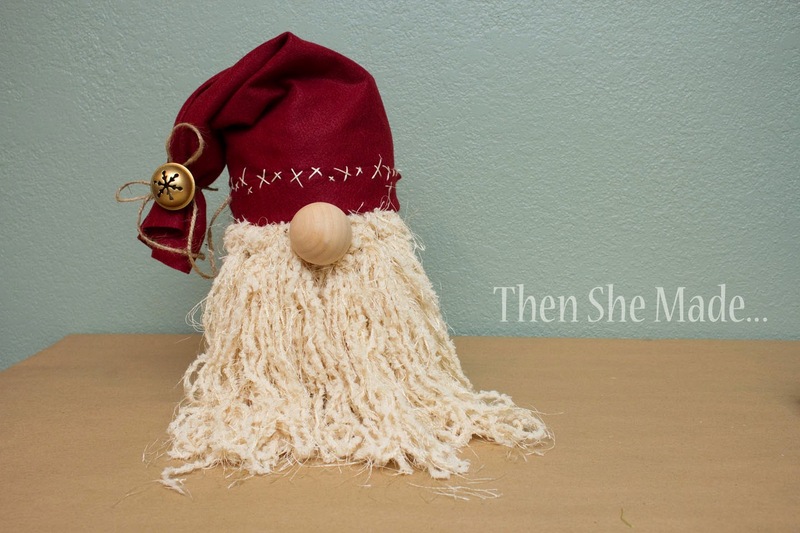 Variation #2 - The Santa. 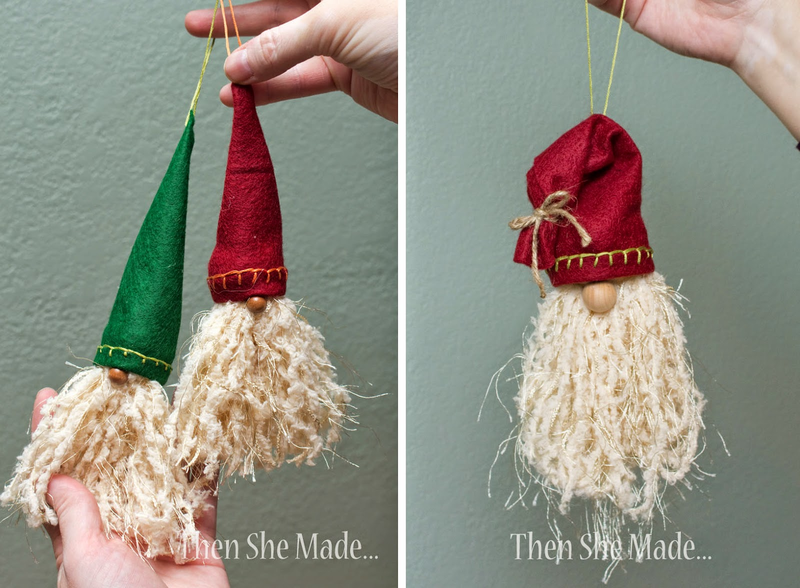 Above we made the little gnome/elves but if you want your ornament to look more like a Santa, just fold the hat over, tie a little bow to the end and secure with a little bit of glue. Then sew on your floss loop at the top of the fold to make the hanger. Variation #3 - The disguised treat bag - mine is hiding the yummy kettle corn popcorn I talked about last week - I had to go buy more bags because we gave all our others away (or maybe we ate some of them - shhh!) My disguised treat bag has popcorn in it but you could probably do this with any type of treat bags. 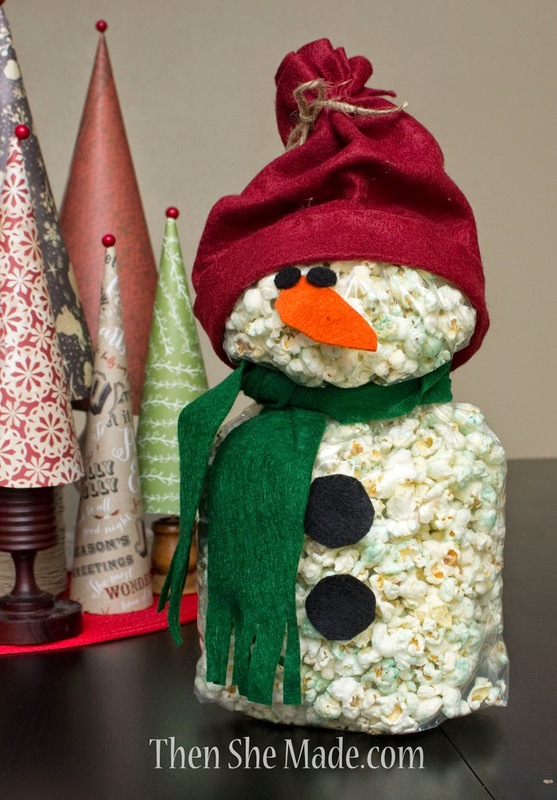 Would you ever guess that there was a bag of popcorn hiding behind this cute Santa? Well, it's true, there is. Here's the deal, I basically just followed all the steps for the tutorial I shared above but I increased my sizes. The beard is fuller and longer, the hat is wider and the nose is bigger. 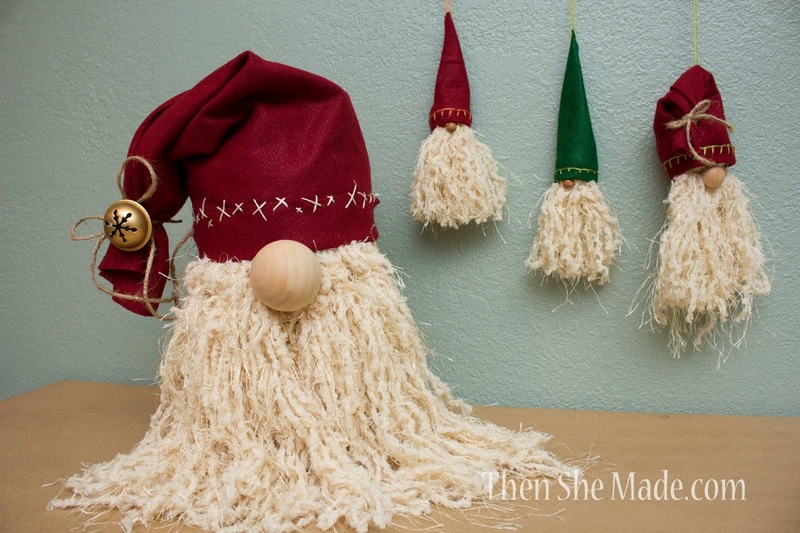 Also a quick tip on making the beard - Use 5 sections and run a piece of twine or yarn through all the loops. Make your twine long enough that you can just tie the beard on, using hot glue on a plastic treat bag isn't really a great idea as it will melt it. 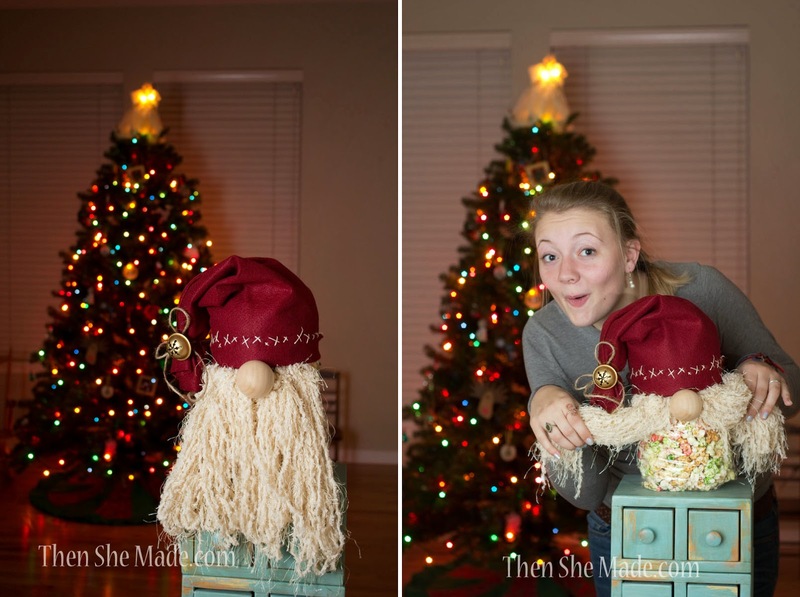 Also, making the beard this way will allow your daughter to play dress up, because well, beards are awesome and who doesn't want to wear a big bushy Santa beard?! P.S. Thanks to everyone who went and checked out A-Maize'n Kettle Corn. I've heard that some of my readers have been buying popcorn from them and from what I understand some of you are even having it shipped. I wasn't paid to promote them in anyway but I do like sharing when I find a local business worth sharing. So thank you for helping me support them. They introduced a new flavor for Hanukkah, it's blue and white called Wintermint, I couldn't resist making a snowman out of that blend. I am so excited to see this post from you. I haven't seen anything in so long I could just shout and want to give you a hug to see your creativity again!!!!!!!!! Glad to see you are back crafting! These little guys are all darling! Wonderful post and congrats on a successful move. Blessing to you and your family in your new home!